Animal shelters in Brazil are underfunded and overcrowded, and many families automatically bypass shelter pets - choosing to purchase a pricey puppy rather than adopt a free rescue. One Brazilian rescue organization set out to change this: Quatro Patinhas, or "Four Paws," secretly stocked a pet shop with rescue animals. 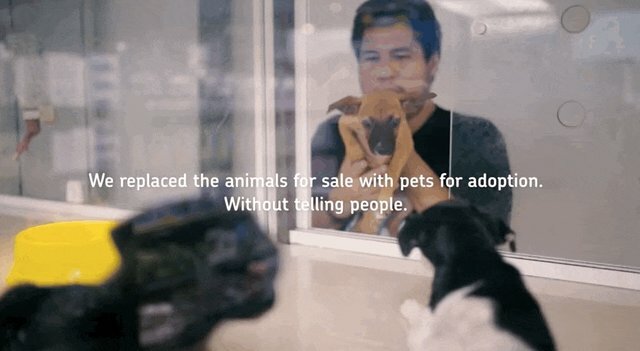 Then they set up hidden cameras to catch families' reactions when they found out that the sweet puppies and kittens were actually shelter pets ... and that it cost nothing to adopt them. "There's no difference if a pet is purebred or not," Christianne Duarte Garoiu, president of Quatro Patinhas, says in the video. "What really matters is the love that will arise there." The families in the video learn a priceless lesson when they realize that shelter pets are just as special and deserving of love as any other animals. Watch the whole tearjerking video below.